Updated, Thursday October 2nd, 2014: Niran released Black Dragon 2.4.0.1, a “feedback update” containing a number of additions and revisions based on feedback received for the initial 2.4 release. These includes a revision to the world map, see the end of this review for details, and the Black Dragon 2.4.0.1 blog post for a complete list of revisions. NiranV Dean released the latest version of his Black Dragon viewer on Sunday September 28th. Version 2.4 Beta, which is supplied in two flavours, a “normal” version, which comprises Niran’s additions and modifications to the viewer merged up to the Lab’s 3.7.15 code base (and is thus also referred to as version 3.7.15.33763) and a “current” version, which also has Niran’s updates and additions, but merged with the Lab’s 3.7.17 code (and is thus also referred to as 3.7.17.34052). As well as emphasising this is a beta, with work still to come, Niran notes that the 3.7.17 version has not been thoroughly tested, and as such, may be subject to issues which might not be found in the 3.7.15 version. Keeping this in mind, for the purposes of this look at Black Dragon 2.4, I opted to go with the 3.7.17 version. Note that this isn’t intended as an in-depth review of the viewer, but rather an overview of some of the more significant updates, together with some initial feedback. This release of the viewer does away with the YouTube video which has been a feature of many of Niran’s viewer releases, and the log-in credentials area of the screen has been updated. Gone are the bold links to the right of the log-in area, replaced by a set of smart-looking buttons directly above the log-in credentials fields, with the Quit button ranged to the right and a link to the Black Dragon change logs to the left. A large, friendly CONNECT button has also been added below the credentials fields. The 2.3 release of Black Dragon, as noted in my last look at the viewer, saw some changes to the UI and to the toolbars, The “ink blots” effect within the UI are still there, but are more subtle in nature that the last release, although they have now found their way onto the various panel floaters as well, giving them a ragged look I personally found distracting; I found my eyes being drawn to the edges of any floater I opened, particularly if opened against a much lighter in-world background, rather than focusing on the options within it. In my last overview of Black Dragon, I pointed to the new toolbar button placement area Niran had implemented, up in the top left corner of the viewer window, where one would normally expect to see the menu bar options. Buttons displayed in this area default to Niran’s “Tiny” size, and while it was a good use of available space, it could quickly become overrun if button labels are used rather than icons, or someone went daft placing buttons there, leading to the buttons wrapping themselves over two or more rows. More particularly, displaying the Navigation Bar / Favourites would result in the Navigation Bar clashing with any buttons placed there. Niran has solved this latter problem in version 2.4 Beta by providing a new toolbar button. This is displayed by default when clean installing Black Dragon (or can be selected from the Toolbar Button floater). When clicked, it “opens” the Navigation Bar and Favourites, hiding the top button area (and also the Dragon menu, it must be said). The Navigation Bar has a corresponding button on the right-hand end which will hide them again. Two other new toolbar buttons with this release are the Teleport History buttons, which allow you to teleport back to the last location visited, or on to the next location (if any) in your teleport history. Again, these buttons are displayed by default during a clean install, or can be selected from the Toolbar Buttons floater. The Preferences panel witnesses improvements in layout, with a number of outdated options (such as Niran’s own Navigation Bar buttons for editing the sky, etc.) removed, and a general improvement on font and colour contrasts against the darker background of the viewer’s UI which does much to assist readability. Those perhaps small, these updates do much to make scanning through the Preferences options a lot easier on the eye. Specific improvements to Preferences see the following panels overhauled: General, Display, Sound and Media, Chat, Camera, Interface and Viewer. Some of these see layout overhauls, some include new options or updated capabilities – please refer to the change log for specifics. Alongside the Preferences panel, a number of other panels have also been overhauled, including the: People floater (incl. the Group tab), appearance panel, Outfit selection panel, Picks, and Destinations floater. Please refer to the change log for a full list of updates and changes. Please refer to the end of this article for notes on the black Dragon 2.4.0.1 update, which revised the world map to address some of the comments mentioned below. The World Map gets a further update with the 2.4 Beta, which sees the layout once again resemble the World Map found in other viewers – albeit with the legend moved to the left side of the map this time, rather than along the top, where they are joined with the coordinates display and the option buttons. The search options remain to the right of the map, and slide into view when an additional Show Search button to the left of the map is clicked. Personally, the World Map legend in something I tend to set & forget. It’s the search options I use a lot more frequently, together with the coordinate fields and Copy SLurl options. I think I’m likely not alone in this, so if the World Map is to be revised, I’m surprised that no-one has made the legend the section hidden by default (if, indeed, anything really needs to be hidden) and left the more frequently used search options available for use, be they to the left, right, top or bottom of the map itself. It may not result in so much of a saving in screen (or map display) real estate, but I’d take convenience of use over having to click buttons to reveal slide-out options. A further, and curious, change is with the L$ account balance display. Normally displayed towards the top right of the viewer window, Niran has removed it to the foot of the Inventory panel. Frankly, I’m not sure of the reasoning behind this; it doesn’t appear as if you can currently click on the displayed balance and open the Buy L$ floater (you need to go via the Dragon menu) – although, being beta, this may still be on Niran’s “to do” list. However, even if the ability to buy L$ is added, this change appears to sacrifice what was previously a quick flick of the eyes to check your account balance into an unnecessary need to open a floater. Hardly convenient, and something I could personally do without. Black Dragon 2.4 is another evolutionary step with the viewer. There may not be lots of stand-up new shiny that screams at you when you launch the viewer, but that doesn’t mean it’s not there – nor should this review be taken to mean it’s not there. With this release, Black Dragon is on par with all of the Lab’s updates through to at least 3.7.15, and that accounts for a lot. It’s also true that Niran has been working hard under the how updating, tweaking, adding, removing – as indicated in the change log, which I (again) direct you towards for specifics. There are a couple of things I’ve critiqued here, because I’m genuinely not sure they really add value to the user’s experience. The account balance move in particular really doesn’t seem to add anything to the viewer, and tends to fit with the old adage, “if it an’t broke, don’t fix it”, but perhaps I’m missing something in this rapid run-through. Performance-wise, for the brief few hours I was using the viewer (the 3.7.17 version, as noted towards the top), it ran flawlessly and did everything expected of it. Those interested in photography and machinima may well want to dwell on the Machinima Sidebar in the viewer, which has seen some nice nips, tucks and additions. I don’t find it quite as convenient as using Will Weaver’s Phototools floater, but there’s a lot packed into the Sidebar which makes it very useful. With an AO system apparently being worked on, together with further updates to come – this is only a beta, after all – it’ll be interesting to see what comes forth with Black Dragon over the next few releases. Released on Thursday October 2nd, the 2.4.0.1 release of Black Dragon makes a number of updates and changes to the viewer based upon user feedback. In terms of this review, the 2.4.0.1 release offers a revised world map, which addresses some of the observations I made when writing this article, as such, I’ve included this addendum to reflect these recent changes. 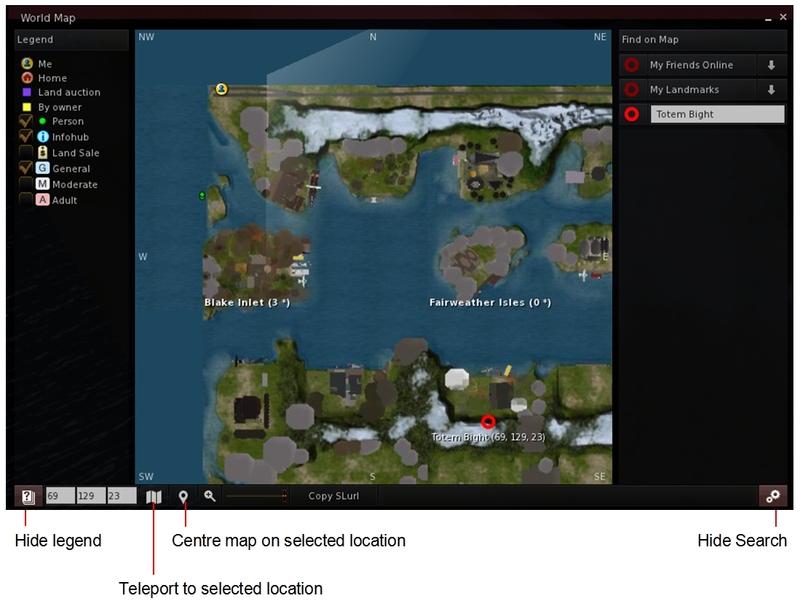 The revised map moves the map coordinates fields, zoom slider and Copy SLurl button and teleport button to the bottom of the map floater, together with the button to slide the search options out of the view. In addition, the bar adds a button to centre the map on a clicked location and a button to slide the legend out of the view, for those of us who rarely (if ever) need to refer to the legend. All told, a nice way of meeting disparate needs in using the map while keeping the floater to a compact size. Kudos. You’ve misread the AO part a little bit. I am not working on a built in AO for the Viewer, instead (because i hate and disagree with built in AO integration) i made a separate attachment one. Which i worked a lot on filling with the most important features, making it fast and reliable as well as very memory saving. The account thing had to be done because of the top bar changes, there was simply no space anymore to put the balance view in without extending (and therefor most likely breaking the look) or redoing it (which would have entirely changed the look i was totally happy with). It shouldn’t be a problem tho unless you need to keep track of your balance every second for some reason. Your inventory is open more often than not (when changing stuff or when getting stuff) and your balance should also be shown in several other places such as the buy floater when buying something, not to mention it is shown in the marketplace which many people use too. So it is more of a minor inconvenience and you get used to it over time just like everything else. About the World Map… i will have another look at it at some point. Probably rearranging stuff a bit, maybe finally adding a button to hide the Legend too. Ta for the note on the AO element. While the account balance is available elsewhere, it’s still a case that having it displayed openly avoids the need to look “elsewhere”, be it through opening the Buy L$ floater or switching to your dashboard or going to the Marketplace – or opening Inventory. Yes, the inconvenience is minor, but it’s one that has been introduced, which is a shame. I see the balance change as welcome, as it centralizes the things one “owns”; their stuff, their money, their received items. There’s also the fact that not everyone likes to show how much L$ they have when taking UI screenshots and the balance hiding code has been gone for a while now (last time I checked). I agree with Inara that not having the L$ buy/balance visible in the top bar is an inconvenience, which makes it it harder for me to monitor my L$ balance. Having to buy L$ via the main menu, and then open the inventory to see the L$ account balance seems less intuitive and more steps. The preferences setting to select the internal or external browser are now gone. The only way to view a link in the external browser is to first open it in the internal browser, then hit the button on the right of the URL bar. Again, an inconvenience, but one that adds extra steps to an otherwise quick task. It is not gone. Go to preferences – notifications and select the notification in ‘Never show’ for the external browser question. Move it up to ‘Always show’ and then open a link, it should ask you if you want to open the internal or external browser, you can then check ‘always open with external browser’ to open it with your external browser at all times.